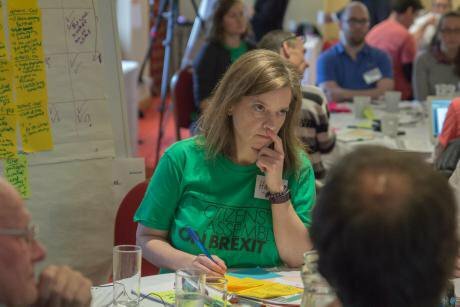 Citizens Assembly on Brexit, Manchester, 2017. Cade Hannan. All rights reserved. A ‘local constituency pact’ is hardly the most exciting title for a campaign initiative. To the seasoned campaigner for whom blockading London bridges or dangling from a crane with a giant banner saying ‘RESIST’, is what it is all about, then this proposal is hardly going to get the blood racing. But bear with me, hear me out and just maybe I can persuade you that this tool, if shared and applied widely, could be vital to restoring real democratic power. First pause for a moment and ask yourself why we have to resort to increasingly desperate and imaginative tactics to get our voice heard – whether it is the bike ride against inequality, or the Sleep Out campaign to end homelessness? This is not to dismiss the impact of such campaigns, or the relevance and urgency of their message. Rather, it is to highlight the failure of ordinary means of democratic expression – our vote and our voice – to make a difference. In a debased democracy, these no longer count. Yet in resorting to bold acts of civil disobedience and innovative campaign tactics, the danger is that these lean more towards media spectacle and soundbites in place of informed public debate. Yet the biggest flaw in such campaigns is that even if they achieve their goal, they leave untouched the deep structural inequalities of power that gave rise to the injustice they seek to address in the first place. If they are successful, all that happens is that vested interests beat a strategic retreat; noises are made about ‘listening to the people’, a press conference is called, a new policy announced, and money allocated that was previously cut. At best, what we as campaigners reap is a false sense of achievement and some public acclaim. Nothing really changes. It is this fundamental structural inequality of power that is the nub of the issue. To give it a name, it is ‘constitutional’, for national constitutions are all about the rules by which power is exercised and by whom. In the UK, we have an uncodified constitution composed of unwritten rules and conventions that are easily gamed and changed to suit the convenience of a political elite. This has allowed the overcentralisation of power, whose closed and circular direction of travel is inwards between Westminster, Whitehall and the City of London. Its gravitational pull has gutted local democracy and reduced local government to being the mere delivery arm of the central state. The ultimate answer to all this lies in a proper codified constitution which forms the highest law in the land and to which even Parliament is subject. It must define the rules and principles by which power is exercised, the relationship between central and local government, and it must be the work of a proper citizens convention rooted in ‘We The People’, not the plaything of lawyers and constitutional experts. With the constitutional crisis brought about by Brexit, we may be nearer to that moment than we think. In the meantime the local constituency compact approaches relationships of power from the bottom up – the communities where we live and work. It is a charter for strong local democracy and you can see a downloadable working draft here. It is divided into three parts. Part one is a code of conduct which seeks to re-balance the relationship between MPs and their constituents. It calls on candidates to acknowledge that their first duty is to their constituents, not their party and not Westminster. Part two seeks to re-balance the relationship between Westminster and local government. It seeks to place local government on an independent constitutional footing, with its own rights and powers, fully funded, and free from the constant interference of Whitehall. Part three is about electoral reform with the principle of proportional representation as a means to end single party rule based on a minority of votes. In all cases the pact seeks to redefine relationships of power between constituent and MP, local government and Westminster, political party and voter. It sets out policy principles rather than specific issues such as an NHS or the madness of fracking. The latter are symptoms not the cause. To achieve our different campaign goals whatever they may be, we first need to end Westminster rule. This is the crucial battle that has yet to be fought. Win this, and everything else follows. Ignore it and we will forever be fighting battles we thought we had already won. Campaigning in silos to address specific grievances no longer works – if it ever did. We need a unifying agenda for change that brings together diverse community and campaign groups with the single over-riding objective of taking back power. The constituency pact is a first stab at this; we hope that others will build on this, do it differently and do it better. If so, share back!